Skype for Business is a great collaboration tool that makes it easy for business to hold quick virtual meetings. It has tons of useful features and can be an asset to any organization. Unfortunately, most people do not take full advantage of this service. You may be asking the following question at this point in your search for a conferencing solution: Why would anyone want to pay for a premium conferencing platform when there are countless services available for free online? After all, there’s no better way to save money than by investing in a free product, right? For most web conferencing users, a point of emphasis when selecting a webinar platform is ease of use. Whether you are trying to initiate internal employee collaboration or want to engage with outside opportunities, an easy-to-use feature-rich web conferencing platform is the best solution for you. Is It Really Time to Interview Again? One of your best employees just handed you some bad news: She’s moving on to another opportunity. This means you need to scramble to find a solid replacement. Conducting a webinar can be a daunting task for some; others may view it as an opportunity to show off their creative side! 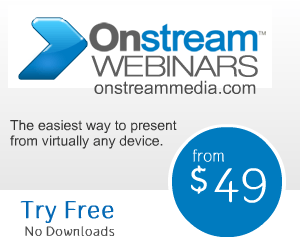 Whether you are new to conducting webinars, or if you are a seasoned pro, Infinite Conference, an Onstream Media company, wants to help by providing you with a few simple tips for conducting a fantastic webinar. Right now, your brand is undergoing a massive transformation as many of its core products become IP-enabled. The Internet of Things (IoT)—or the global movement that will result in billions of ordinary objects and systems connecting to the Web— has come to your enterprise. As a result, your company is rebranding itself as a provider of next-generation solutions. Frustrated With Your Business’s Web Collaboration Software? You’re Not Alone! There’s nothing worse than feeling like your online business meeting is at the mercy of your unpredictable Web collaboration software. Buggy, outdated and inefficient software can send the wrong message to your client: that your business lacks the necessary technology to consistently perform at a high level. As of August 5th Cisco WebEx users who have downloaded the Microsoft update KB3069392 have been unable to utilize screen sharing capabilities. Have you been rifling through Google, trying to figure out the difference between Web conferencing, video conferencing and webcasting? If so, you’ve come to the right place. Right now there is a lot of focus on the need to build comprehensive, long-term marketing strategies. In other words, marketing collateral shouldn’t just work to obtain customers in the short term. Each asset should also work to build awareness about other assets and your brand as a whole. How Often Should You Host A Webinar? We’ve all sat through an amazing webinar—that is, one full of interesting speakers, great video clips and thought-provoking customer questions—only to want to attend another one after it’s finished. Your company spent a lot of money investing in a digital communications suite so that your employees could connect and collaborate among themselves. Unfortunately, none of your younger employees are using this platform, preferring instead to utilize private services to exchange boatloads of important data. Right now, WebRTC is receiving a lot of mainstream media attention due in large part to the fact that it’s free and comes with the promise of easy browser-based videoconferencing. But is WebRTC worthy of all of the hype it is receiving? Dig deeper and you’ll notice a very big flaw: It’s unsupported by Microsoft and Apple browsers. This means if you move forward with a WebRTC-based solution, you will not be able to use it to communicate with business partners or customers on Safari or Internet Explorer. A traditional Web conferencing product like Onstream Meetings, however, can be used with any browser regardless of its developer. Therefore, you won’t have to worry about issues stemming from incompatible browsers, like confused end users and missed messages. Further, you won’t have to ask your contacts to switch to a browser with which they are not comfortable. Another great aspect of a solution like Onstream Meetings is that it doesn’t require a software installation on your corporate computers. Since Onstream Meetings operates through the cloud, you simply log in when you want to access the software. This also means you will not have to perform system updates. WebRTC, for that matter, is open source—so it will require your developers to keep a close watch for updates and security patches. Further, through Onstream Meetings, you will gain access to over 100 conferencing features that you can use to enhance your online meetings and ensure great conversations. Click here to learn more about why you should steer clear of WebRTC and invest in a robust conferencing solution like Onstream Meetings. When you think of online meetings, chances are likely that corporate use cases come to mind first. But as many organizations are proving, Web conferencing can fulfill a variety of other needs as well. You were just handed a report with market research indicating there is a big demand for your business’s services in the U.K. Your job is to capitalize on this opportunity and tap into the market in the most direct and cost-effective way possible. Are you wondering how small businesses are utilizing Web conferencing in their organizations? Recently, Software Advice tackled the question head on in a survey of employees who work in companies with 50 or fewer workers. Picture this: Jack sits down at his favorite spot in a local café with a coffee and a laptop. Opening his device, Jack logs onto what he thinks is the business’s private Wi-Fi connection, and then onto his online meetings platform for a text-based conversation with his team members about an important project on which they are working. Let’s be honest: You weren’t totally satisfied with the last webinar you hosted. Your team is a half an hour into a Web conference, and it’s firing on all cylinders. First, the meeting started off with a short video presentation that sparked a lively discussion. Now, your team has broken down into smaller groups to collaborate, and will come back together to form actionable plans. What’s going on here? This does not resemble the type of nightmare conference call that your team used to have to sit through every week. Your team is inspired and working together to solve problems; your weekly meetings are no longer an obligation, but a chance to spark business-changing ideas.